Throwback Thursday! This recipe is from waaaay back when I first started blogging and had no idea what to do with a camera. Every Thursday I’ll be featuring an “old” recipe with a little makeover! 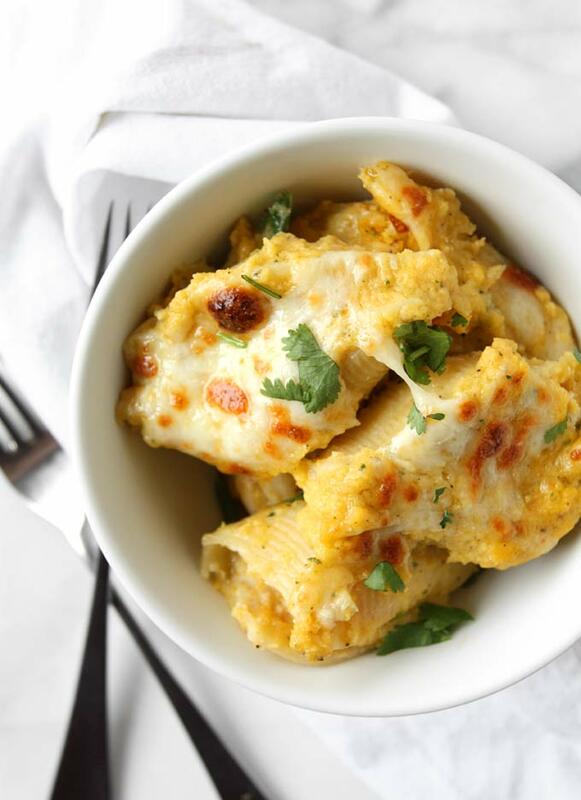 This recipe is still one of my favorite “healthier” takes on a classic old Italian dish — it’s still cheesey and delicious, but the butternut squash replaces some of it and adds delicious flavor to ALL of it! Also: I MADE YOU A VIDEO! Again. I’m on a roll, I guess! You check out my YouTube channel, if you haven’t already! The rest of this post is from the original way back when! I was really fortunate, in many ways, during my childhood. I went to a wonderful school, had wonderful friends, was active in what seemed like every extra-curricular activity I could imagine, and I had a Mom who cooked fabulous food on a daily basis. In fact, she still does cook fabulous food — I’m just not there to eat it anymore! As I entered a world, after high school, where I was more aware of the eating habits of the general public, I was amazed at the homogeneity of what most people eat. I in no way mean this as an insult to the general public, but rather as a way to point out that I am so grateful to have been exposed (and yes, sometimes forced) to a wide variety of foods from all different ethnicities. I honestly don’t remember specifics of what Mom cooked for us, but it seemed to always be something exotic, flavorful, and not American. I don’t think she’s ever purchased Hamburger Helper, and I don’t imagine she ever will. 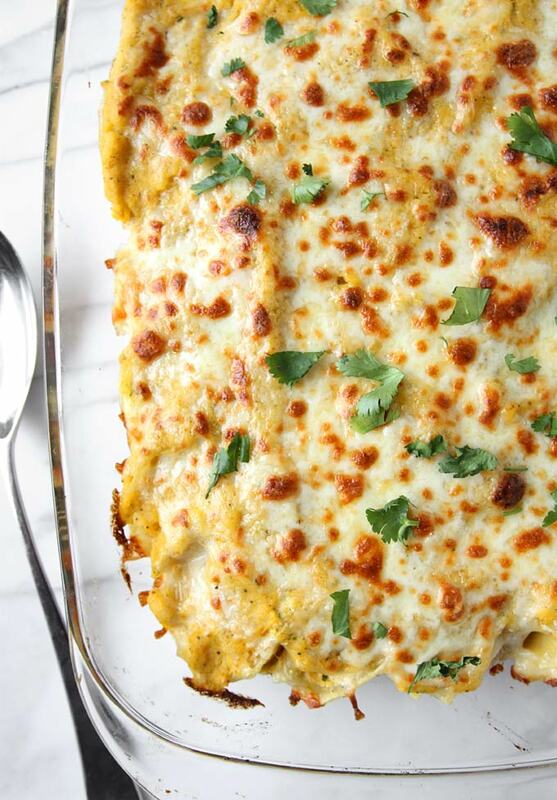 The only dish I specifically remember which strikes me as somewhat “normal” is stuffed shells, or manicotti. I remember loving it in either form, and it almost seemed like a special treat to my childlike taste buds. I ate many a curry and all sorts of vegetables, but I do know I was glad for some cheesy pasta. To this day I enjoy eating stuffed shells, and while having a squash craving recently I decided to combine two of my loves into one! I really just replaced some of the ricotta with mashed butternut squash, and added the sage for a complimentary flavor. 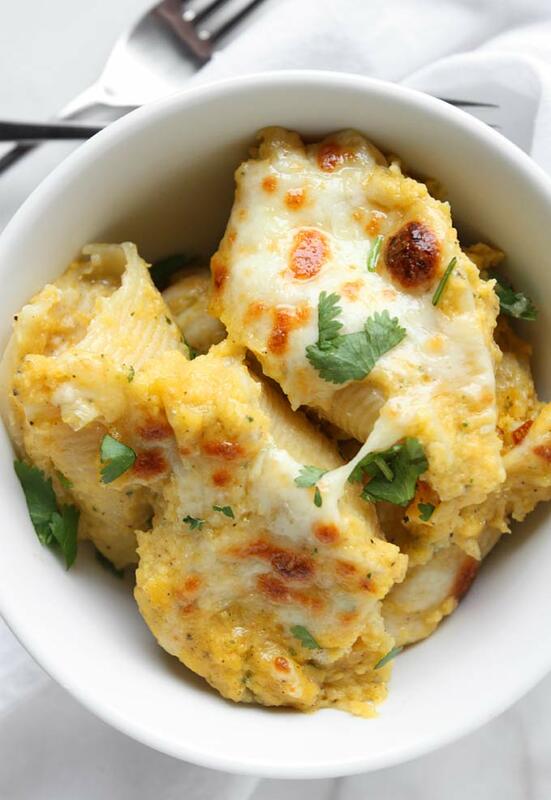 Can I venture so far as to say this is a *gasp* healthy alternative to normal stuffed shells? No, probably not. It still has plenty of cheese to make it awesome! Begin by preparing the squash. Cut it lengthwise and remove the seeds. Brush each side with olive oil or butter. Bake at 400 F, cut side up, in a pan with one inch of water in it, for about 40 minutes or until the flesh is tender. Remove from the oven and allow to cool before scraping out the insides. 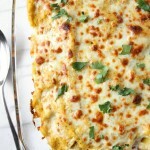 As the squash cools, cook the shells until al dente. Drain the water, and toss with olive oil. Set aside. For the sauce, brown the butter in a small saucepan. Once the butter is browned, pour to a separate container and add the fresh sage. Combine sage butter with the rest of the sauce ingredients in a food processor and blend until smooth. The optional broth is just for if you want a thinner sauce — you can add as much or as little of that as you want. Pour enough sauce to coat the bottom of a 9×13 inch baking dish. 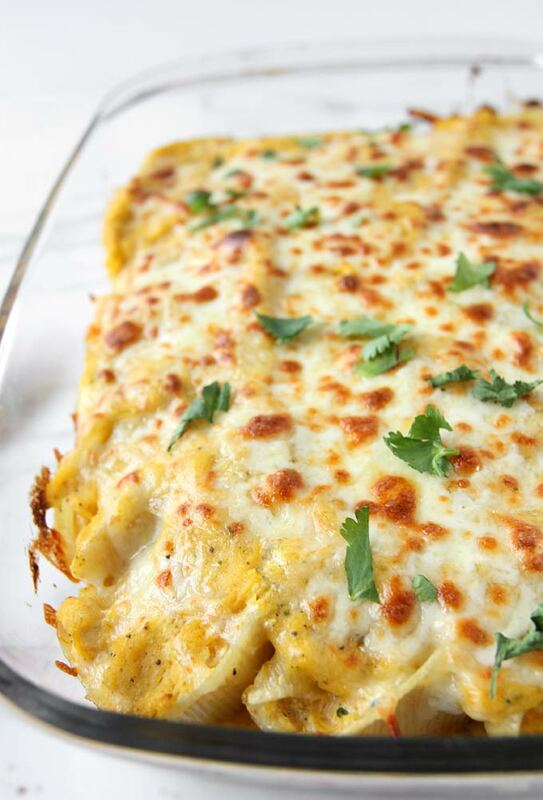 For the filling, combine two cups of mashed squash, the ricotta, egg, cheeses (SAVE 1 cup of the mozzarella for topping), sage, salt, and pepper. Mix until completely combined. Carefully spoon filling into each shell and arrange, seam side up, in the 9×13 baking dish. When all of the shells are arranged, pour the remaining sauce over them, and top with the remaining mozzarella. Bake the dish at 350 F for 20-25 minutes. Broil, right under the broiler, for 1 minute to brown and bubble the cheese before serving topped with fresh chopped sage and grated parmesan. What a great idea! I always see butternut ravioli recipes around, but stuffing the filling into shells (as opposed to trying to make homemade pasta on a weeknight) sounds so much easier. This is definitely going on the must-try list. Thanks, Eileen! Let me know how it turns out! Hey Mary – any tips to make the sauce lighter? I'm thinking of trying this next week, but I'm pretty wary of the 0.5 cup of cream + butter in the sauce. Hi Laura! I don't blame you for being wary of the cream and butter! First thing would be just to change the cream to milk – whatever percentage you're comfortable with. You could decrease the amount of butter, but I would omit the cream entirely before losing the browned butter flavor, personally. The squash, combined with the spices and browned butter, makes a lovely sauce. I just added the cream to make it a bit more hearty – it's easily omitted! I hope that helps! Really enjoyed the video cooking demonstration and glad you got your food processor to work LOL! I just made these and they were so amazing!!! Hello! Do you think I could make these the night before and keep them in the fridge?